Episode #171 Part IX: MegaCon 2011 Wrap Up! 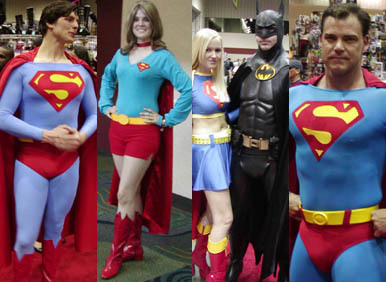 Various "Super" Cosplayers at MegaCon 2011! Download Episode 171 Part IX! In this final MegaCon 2011 episode I review the panels I attended which I was not able to post audio for, as well as share my final thoughts about the convention. I also mention Billy Tucci's upcoming story for BIRDS OF PREY for DC Comics, although I don't know when it is scheduled to be published. - THE NEW YORK CONNECTION: Amanda Conner, Frank Tieri, Jimmy Palmiotti, Joe Jusko, Nelson DeCastro and Billy Tucci talked about growing up in the NYC area (except for Amanda) and shared a lot of funny stories about working together in the comics industry while they all lived there. - SPOTLIGHT ON DC COMICS PANEL: Geoff Johns, Dan Didio, Steve Scott, Rob Hunter, Ethan Van Sciver and Tony Bedard. I only attended part of this panel, since the previous one ran late. This panel was standing room only, but I did catch the brief discussion about the Doomsday storyline leading into ACTION COMICS 900. Dan Didio also responded to a compliment from the audience about DC's price reduction back to $2.99. - THE FUTURE OF COMICS AND NEW MEDIA: Darwyn Cooke, Terry Moore and Jim Valentino discussed the potential they see in comic book storytelling through digital distribution. - THE DO'S AND DON'TS OF COMICS: Steve Scott, Allen Bellman, Frank Tieri, Nelson DeCastro and Paolo Rivera discussed the ins and outs of becoming and remaining a comic book professional. Another panel I attended which I failed to mention was titled, SUPERMAN'S FATHER, which was a Q & A with actor John Schneider,who portrayed Jonathan Kent on the TV show SMALLVILLE. He had a great sense of humor in relating stories about his acting and music career, as well as his future projects after SMALLVILLE. Next Episode: SUPERMAN COMICS COVER DATED SEPTEMBER 1958: SUPERMAN 124 & ACTION COMICS 244! And in 2 weeks: SUPERMAN FAMILY OF COMICS COVER DATED JULY/AUGUST 1955: SUPERMAN'S PAL JIMMY OLSEN 6 & WORLD'S FINEST COMICS 77! Episode #171 Part VIII: Spotlight On Amanda Conner Panel! 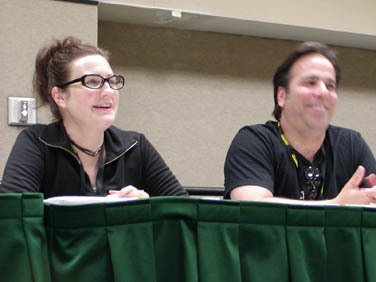 (L to R:) Amanda Conner & Jimmy Palmiotti! Download Episode 171 Part VIII! 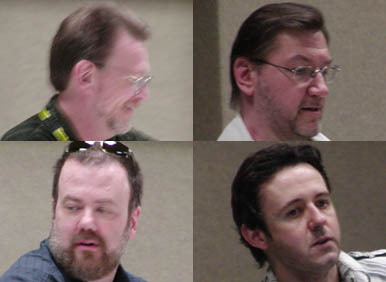 This was the third panel I attended on Sunday,March 27, 2011. It was a question and answer session where Amanda Conner discussed her art career, and she was joined early in the panel by Jimmy Palmiotti. The discussion also touched on their lives together. Next Episode: MEGACON 2011 WRAP UP! Episode #171 Part VII: The Art Of The Cover Panel! Download Episode 171 Part VII! 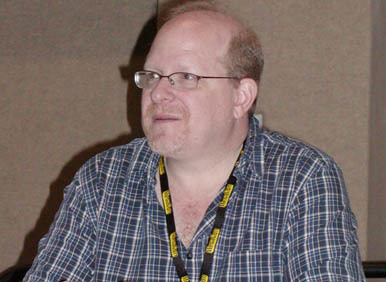 Episode #171 Part VI: MegaCon 2011 The Many Faces Of Mark Waid Panel! Mark Waid at MegaCon 2011! Download Episode 171 Part VI! This was the third panel I attended at MegaCon on Saturday, March 26, 2011. It was a question and answer session with Mark Waid. He has a great sense of humor and lots of stories to tell, and he also discusses present and future projects. If you have a chance to go to a Mark Waid panel at a comic book convention, don't miss it. You'll be glad you did. Next Episode: THE ART OF THE COVER PANEL! Episode #171 Part IV: Comics Writers On The Art Of Writing For Comics! 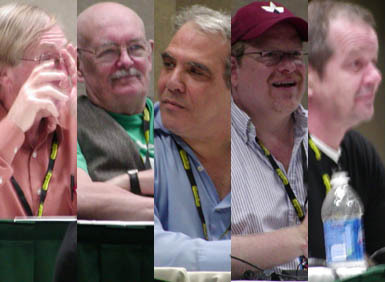 (Left to Right:) Roy Thomas, Denny O'Neil, Jim Valentino, Mark Waid, Darwyn Cooke! Download Episode 171 Part IV! 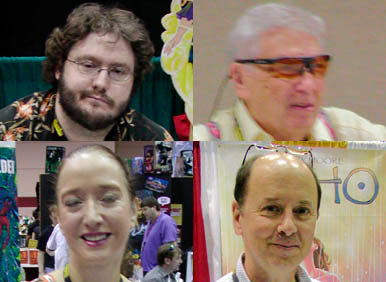 Episode #171 Part III: MegaCon 2011 Spotlight On George Pérez Panel! Download Episode 171 Part III! 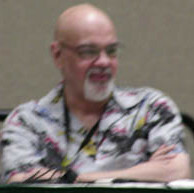 The George Pérez panel was the second panel I attended at MegaCon, on Friday, March 25, 2011. The previous panel ended late, and so the audio for this panel begins in the middle of George speaking. It was an entertaining and informative presentation of his career and some of his interests outside of comic books. Next Episode: COMICS WRITERS ON THE ART OF WRITING FOR COMICS! Episode #171 Part II: MegaCon 2011 Crime Noir Panel! (Top: L to R:) Dave Johnson & Jimmy Palmiotti! (Bottom L to R:) Frank Tieri & Darwyn Cooke! Download Episode 171 Part II! This panel was sponsored by the RACK PACK COMICS PODCAST, http://www.rackpackcomics.com . I would like to thank them for allowing me to record this panel for my podcast as well. 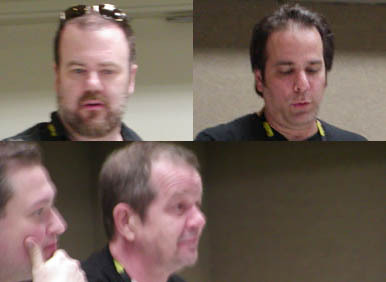 The panelists were Dave Johnson, Jimmy Palmiotti, Frank Tieri and Darwyn Cooke. NOTE: This panel does contain some explicit language, so take that into consideration if you plan on listening to it at work, or around small children. Next Episode: MEGACON 2011 SPOTLIGHT ON GEORGE PÊREZ PANEL! Episode #171 Part I: MegaCon 2011 Interviews! (Top: L to R:) Derrick Fish & Allen Bellman! (Bottom: L to R:) Renee Witterstaetter & Terry Moore! Download Episode 171 Part I! - Derrick Fish, creator, writer and artist who self publishes his title THE WELLKEEPER. http://www.thewellkeeper.com . I interviewed him on Friday. - On Saturday I interviewed Thom Zahler, creator, writer, artist, letterer and colorist of his comic book LOVE AND CAPES, now published by IDW. http://www.loveandcapes.com . - Allen Bellman, golden age comic book artist for Marvel/Timely during the 1940's and 1950's. http://allenbellman.com . - Renee Witterstaetter of Eva Ink Publishing http://www.evainkpublishing.com, http://www.evainkartistgroup.com/ and http://witterstaetterwrites.blogspot.com/ . - Terry Moore, creator, writer, artist and letterer of STRANGERS IN PARADISE, ECHO and, beginning in July, RACHEL RISING. http://strangersinparadise.com . Follow up episodes on MegaCon 2011 will feature the panels I covered. While they don't feature Superman, I want to share some of my convention experience. I enjoy panels about the craft of comic book creation, and spotlight various creators whose work I enjoy, so the panels I'll feature will reflect that. Next Episode: COMICS NOIR PANEL, which was the first panel I attended. Episode #171: MegaCon 2011 Preview! MegaCon 2011 will be open from Friday, March 25 - Sunday, March 27, 2011, in Hall D at the Orange County Convention Center in Orlando, Florida. It is located at 9800 International Drive. The guests of honor are Stan Lee and William Shatner, although I'm not holding my breath about being able to meet either of them, nice as it would be. In this episode I mention some of the comic book guests I look forward to meeting, and hope to interview for the podcast. I also go over the panel schedule and mention the panels I hope to attend this weekend. They won't all be Superman related, but cover different aspects of the comic book industry. Any Superman related news I will also be covering for the SUPERMAN HOMEPAGE website, http://supermanhomepage.com . For any listeners who have not yet attended MegaCon, or any comic book convention, I also give a few pointers so that you can enjoy the Con to the fullest in an organized manner. - EPISODE 118: MEGACON 2010! - MEGACON 2010, DAY 1! http://supermanfanpodcast.blogspot.com/2010/03/episode-118-megacon-2010-day-i.html . - MEGACON 2010, DAY 2, PART I! http://supermanfanpodcast.blogspot.com/2010/03/episode-118-megacon-2010-day-2-part-i.html . - MEGACON 2010, DAY 2, PART II! http://supermanfanpodcast.blogspot.com/2010/04/episode-118-megacon-2010-day-2-part-ii.html . - MEGACON 2010, DAY 2, PART III! http://supermanfanpodcast.blogspot.com/2010/04/episode-118-megacon-2010-day-2-part-iii.html . - MEGACON 2010, DAY 3! http://supermanfanpodcast.blogspot.com/2010/04/episode-118-megacon-2010-day-3-sunday.html . - And for pictures of MegaCon 2010 from my facebook page: http://www.facebook.com/album.php?aid=2033083&id=1239968992&l=c6f45bc404 . Next week: SUPERMAN COMICS COVER DATED SEPTEMBER 1958: SUPERMAN #124 & ACTION COMICS #244! In two weeks: SUPERMAN FAMILY OF COMIC BOOKS COVER DATED JULY/AUGUST 1955: SUPERMAN'S PAL JIMMY OLSEN #6 & WORLD'S FINEST COMICS #77! Drop me a line if you plan to attend MegaCon at the Orange County Convention Center in Orlando, Florida from March 25 - 27, 2011, and I look forward to meeting you there!